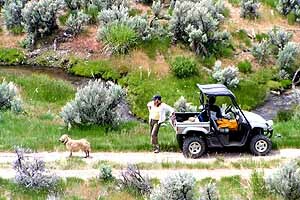 As Nevada’s back country becomes more accessible, our wide open countrysides are attracting more and more visitors. A few weeks ago, they attracted Robin, Chris and me. Chris on his trusty steed. Chris is 17 now, and to celebrate the end of the school year we attended the opening of the Merritt Mountain Trail system in northern Elko County. We participated in a 2-day atv tour with Merritt Mountain our first day’s destination and Harrison Pass in the Rubies on day two, with a night at the Red Lion in Elko in between. The dedication ceremony was heartfelt and brief. 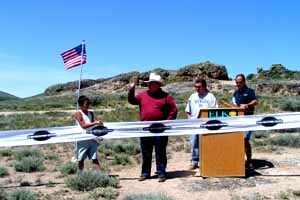 The Dedication Ceremony was at Point of Rocks, seven miles north of Wild Horse Reservoir, which is just under 70 miles north of Elko. Gene Kaplan of Wells and Don Newman of Elko edified the crowd with oratory. 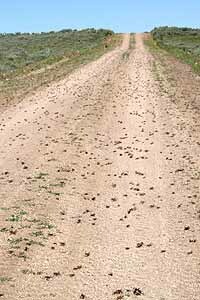 Mormon crickets on the move. The crowd was estimated at 400,000 of which about two dozen were humans, and the rest were mormon crickets. These unappealing insects have been the bane of northern Nevada for the past few years, but this freshly-hatched generation was still young and appeared in many different colors, so they weren’t a distraction, but an odd sort of enhancement to the ceremony. The wildflowers were just beginning to take over the landscape. 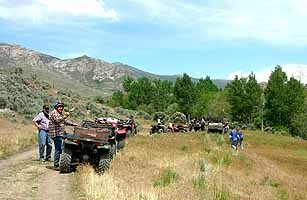 The ribbon cutting was accomplished with aplomb, and in a group of about a dozen atvs of various configurations we headed out on the 68-mile trail to see some country. 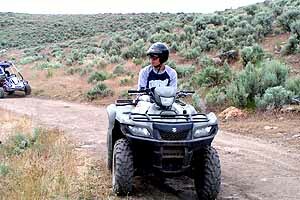 Robin and I traded off driving our Rhino side-by-side, and Chris rode a Suzuki King Quad. The route took us across a high-desert landscape with few hints of mankind’s presence other than the trail — let’s call it a road because that’s what it is — and the dust we raised going through. It includes 80-mile views, eye-catching rock and cliff formations, pine forests, thick woods of quaking aspen (quakies, in cowboy talk) and always the bright blue sky overhead. 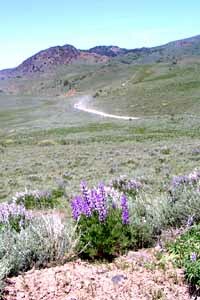 The road leads eventually to the top of Merritt Mountain, about 8,500 feet above sea level, where the view in every direction is pure space, framed by mountain ranges ranking one beyond another into the distances. 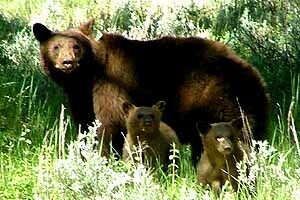 We scurried along the road at 15 mph. There are two other areas in the new trail system. The Hamilton/Bullion route starts three miles from Elko off the Hamilton Stage road, extending along the abandoned Oil Shale Mine, South Fork Reservoir and the historic route taken by the Donner-Reed party in 1846. 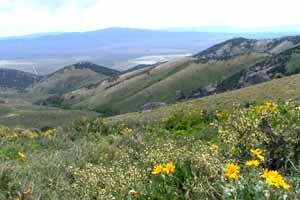 The Spruce Mountain area is south of Wells on U.S. 93, through wildlife viewing areas and uninhabited mining ruins. crossing the highway and returning to the summit from the northeast. Corral Creek from the bejeweled hillside. It led us past Corral Creek, a meandering rivulet between hillsides. I climbed one of them to take photos and discovered the hillside was paved with beautiful rocks, each one different from the next. Some were like alabaster, but with black lines lacing across their surfaces. Others were striped in vivid colors, faced with crystals, dimpled or otherwise surprising in their shapes, colors and textures. And each one unexpectedly different from the next. 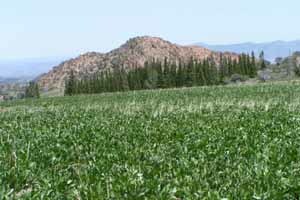 That hillside is a natural jewel box, perhaps noticed by a visitor like you or me every 50 or 60 years. Chris’s favorite stretch of the ride came not long after: taking the wing in a squadron of quads flying up the paved highway as fast as they could go. “It was like Mad Max!” he exulted. 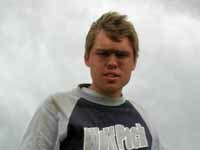 We had our own Mad Max moments too as the Rhino began to stall on uphill climbs. The solution turned out to be keeping the pedal to the metal no matter what. Let up, and the engine would stall. So that was hair-raising, but one particularly harrowing scramble brought us to our own favorite stretch of the trail, putt-putting through a dense aspen forest for half a mile and then abruptly out the other end onto the open brushy mountainside again, and looking down on a series of beaver dams that made the stream a kinetic sculpture. 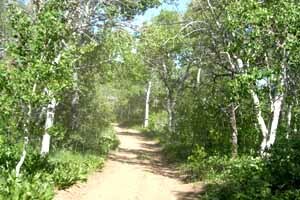 The aspens are so green and dense that they make an exotic environment. The beavers make it extraordinary. summit, stirring up a little less dust as big fat raindrops came heavily down for a few minutes before pattering off toward Utah. But it was still deeply overcast with wet clouds as we hurried over the last hilltop and down toward the paved road, and perhaps the other riders missed the solitary figure seated on a rock and watching us with — was it disdain, disgust or despair? — as we throttled past. He must have been a hiker, following the Ruby Crest Trail. Parts of it traverse wilderness areas, but other parts are open to travel by anything from a pogo stick to a Hummer. Here’s how we think back on the experience: We all had a great time and we are planning another trip to Elko County with the Rhino, this time to explore the country around the Ruby Marshes. It’s quite pleasant to sputter along at 15 miles an hour in our 21st century Model T — it’s the rebirth of the Sunday Drive. But the noise is . . . considerable. I think the best way to traverse this beautiful country is as quietly as you can, so you catch the sounds that Mom Nature offers up: birdcalls, the drone of insects, the rustle of leaves, the insistent whisper of fresh breezes and all the rest. But Robin and I had to shout to each other to be heard. To get the real benefit of the ride you have to stop, shut down the machine and let your senses readjust to the natural world. Also: our group was composed of decent, responsible, careful people, but we left some marks. Not many, but as more people come along they will leave more. “In ten years there will be lots of people out here doing this,” predicts Tom Lester of the Elko Convention & Visitors Authority. 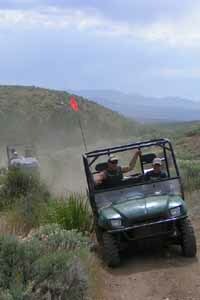 Indeed, Elko holds an annual ATV Jamboree. Base camp is the Elko Convention Center, from which participants from around the country explore the county’s back roads and trail. There’s also an ATV rodeo — riders traverse obstacles and compete in timed games — and an Expo featuring the latest ATV accessories and products. You’ll find me there looking for something quiet. swath of forest and more than 250 homes on the California side of the southwest shore . 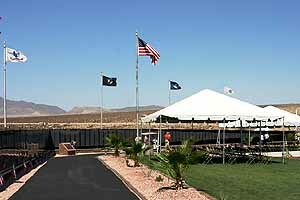 . .
I’m still kicking myself for leaving out one of the key facts about the Tourism Cares event in the last NevadaGram: the 3 kegs of Ruby Mountain Amber Ale served at the barbecue were the subject of appreciative comments and compliments by participants from all parts of the country. And no wonder — it is surely the best amber ale in the world, brewed on the Angel Creek Ranch in Clover Valley Nevada, a dozen miles south of Wells at the base of the East Humboldt Range, and it’s available at Raley’s stores, Lee’s Liquors and other leading retailers around Nevada and adjoining states . . .
Artown, Reno‘s annual summer arts festival, has become one of the largest and most inclusive arts and culture events in the USA. The July calendar features hundreds of performing and visual arts events in dozens of locations citywide. The events include music, dance, theater, opera, children’s workshops, movies in the park, cowboy poetry, historical walks, visual arts and more; click the link above for details. 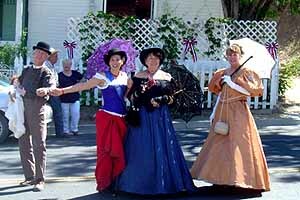 Gridley Days, Austin‘s summer party named in honor of its most famous citizen Reuel Gridley. Reuel Gridley was the other fellow from Hannibal Missouri who came to Nevada and made a name for himself. He was a grocer in Upper Austin (his stone store is still there) who bet on pro-Confederate candidates in the election of 1864, and lost. As a consequence of one of these bets he had to carry a 50-lb sack of self-rising flour on his shoulder down Main Street from his store all the way to Clifton out on the valley floor, while a band marched behind him playing “Battle Hymn of the Republic” and other patriotic Union tunes. Reuel Gridley and his magic sack of flour. On July 4, 1864, he marched good-naturedly down Main Street at the head of the band, and passersby joined the procession, cheering him on. Toward the lower end of town they paused for refreshment once, twice, possibly three times, and by the time they reached Clifton they were a crowd in a fervent patriotic frenzy, singing and cheering at the top of their lungs. 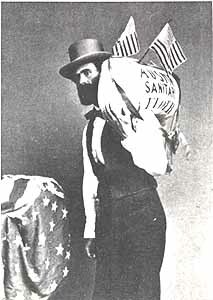 Gridley offerred the flour up for auction, proceeds to go to the Sanitary Fund, a predecessor of the Red Cross providing hospital care to Union soldiers. 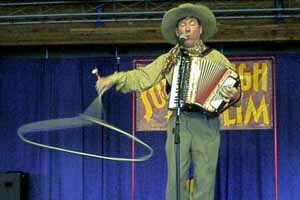 Sourdough Slim is “The most entertaining cowboy singer-yodeler-accordionist extant”;his next Nevada appearance will be in Elko at the Cowboy Poetry Gathering, 2008. 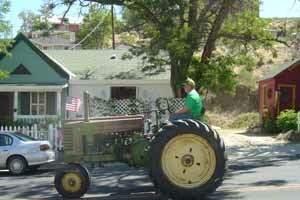 Austin’s minimalist Gridley Days Parade draws the avant-garde from all around Lander County. and eventually to St. Louis, auctioning the same sack of flour over and over until he had raised a quarter million dollars for the Fund and had become a national hero. His old schoolmate Sam Clemens, meanwhile, had become a $25 a week newspaper reporter in Virginia City where he insulted and infuriated local society until he was asked to leave. But by the time Gridley died a pauper in California, Sam Clemens had become Mark Twain and was on his way to being a world figure. 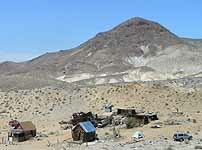 The Californians who are preserving a nameless ghost town in central Nevada returned for a week of work and play. 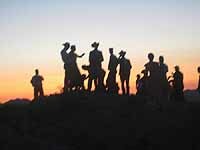 Roofs were fixed, walls shored up, bottles opened, banjos strummed, feasts consumed, endless scatter of stars observed. The party this year featured the inimitable Sourdough Slim (my fave), a great parade, a barbecue and a convivial atmosphere that stretched the day into night . . . Speaking of Austin: St. Augustine’s will host a 140th anniversary celebration July 21 to formally launch the first phase of a ten-year restoration project — a new roof — to include stabilizing the interior murals, restoring the beautiful Henry Kilgen pipe organ, installing electrical and plumbing service, and fitting the building for performing arts and exhibits. The restored Gothic Revival structure will become St. Augustine’s Cultural Center.